Maple Valley Days- FVP Books will be There! June 8-10 is right around the corner. Once again, several of our authors will be attending Maple Valley Days. Look for our FreeValley Publishing Canopy and get your chance to see all of our books and get some signed by the authors. Come and meet us! We’d love to see you there! Be sure not to miss these great opportunities to find books for gifts or for you… by independent authors from FreeValley Publishing and our local author friends. Si View Community Center’s Holiday Bazaar in North Bend on December 5th and at AFK Elixirs and Eatery, Renton – Gifts for Geeks -December 12th. Make a day of it in North Bend with the Santa Breakfast, Santa Train, Local Shopping and Holiday Treelighting Festival Saturday, Dec. 5th. 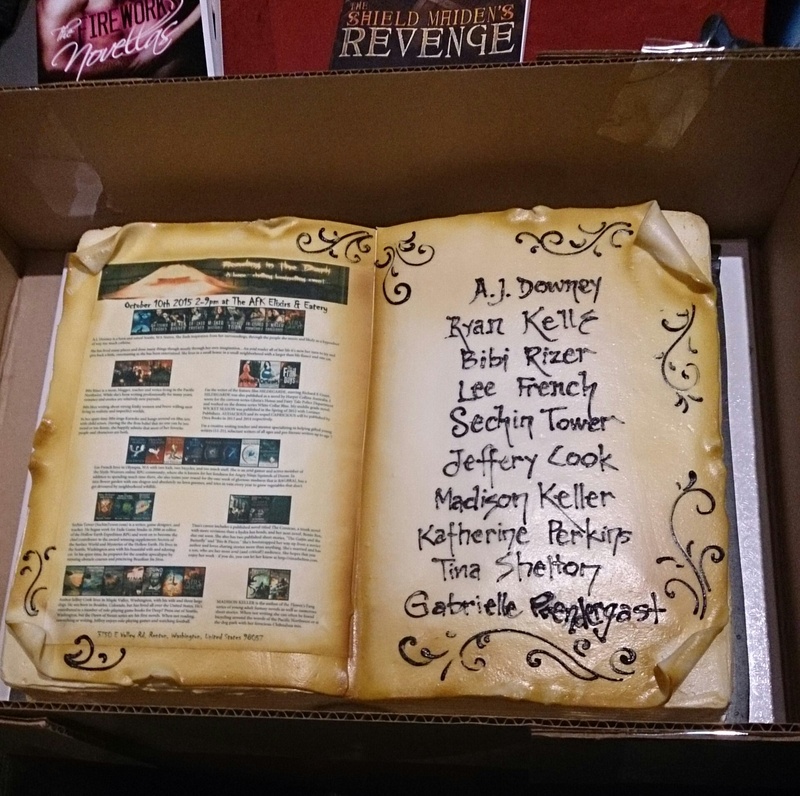 Meet the authors, meet up for gaming and enjoy AFK’s libations in Renton at Gifts for Geeks on Saturday, Dec. 12th. Just had to report that the ‘Reading in the Dark’ event at AFK Elixirs and Eatery was magical! It was great to meet and see so many great authors, including FVP’s own Jeffrey Cook. 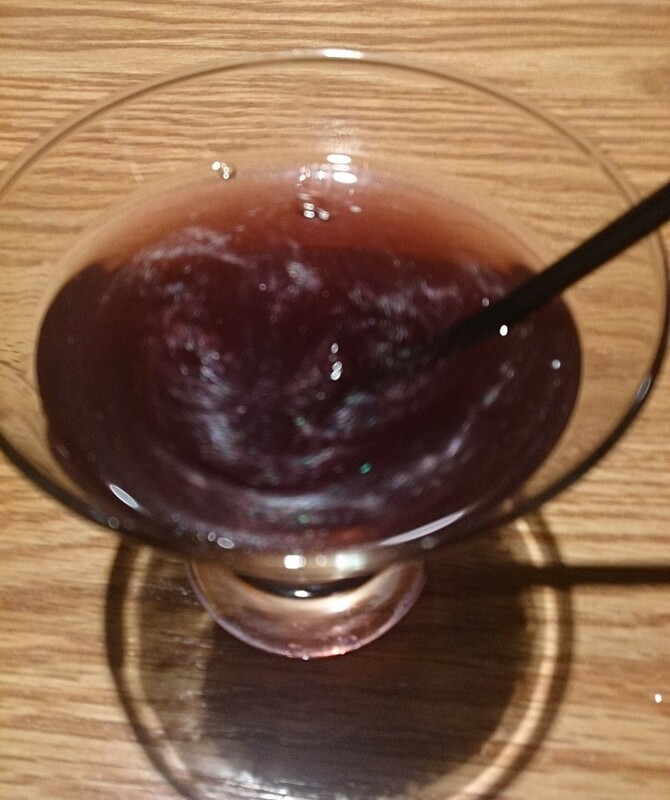 Fun games, tasty food and fantastic, I would even go so far as saying ‘special’ drinks…And there was cake! I also got to check out Jeffrey Cook and A.J. Downey’s collaborative new release: AIRS & GRACES: An Urban Fantasy. Awesome! The ‘Magic always comes with a price’ cocktail at AFK. Shimmery and delicious. If you enjoy the stories posted here at FVP, make plans to come out and see us! FreeValley Publishing’s authors will be at The Black Dog in Snoqualmie, WA on January 23, 2014 6-7:30pm for a Meet the Author’s event. Our authors will read excerpts from their published works and give short commentary on different aspects of self-publishing. We will then be available to chat and sign books for you. This is in league with local chap book makers who will also have works available that evening. Paul Green will play Jazz at 7:30 onward, so you can make it a complete entertainment outing. Come an see us! Click on banner above for calendar and location information. 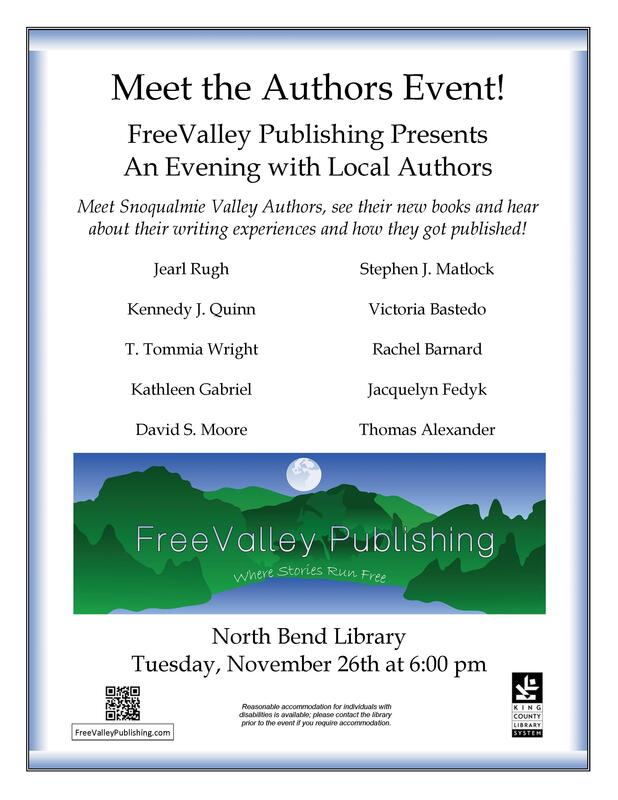 We’ll be at the North Bend Library on Tuesday, November 26th from 6-8. Come and meet all of our Featured Authors, hear about our writing journeys and get your books signed!